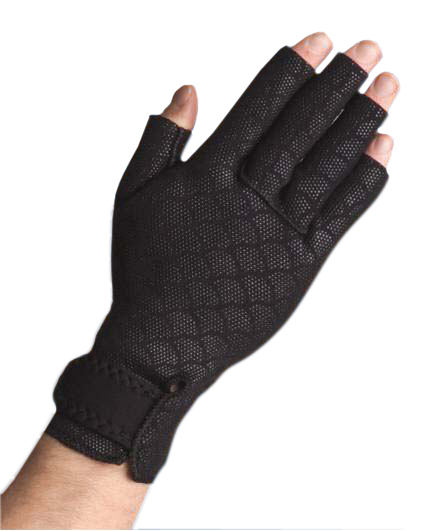 Thermoskin Thermal Arthritic Gloves are anatomically shaped and secured with a velcro fastening. They provide warmth and even compression. The velcro closure allows for added comfort and the outer layer is textured for additional grip. What makes Thermoskin Thermal Support different to any other support is that the inside is lined with a Trioxon coating. Trioxon assists in the retention of the body’s natural heat, thus promoting healing. The construction of Trioxon allows for much improved ventilation and perspiration control at the affected site. The wearer therefore remains comfortable and can enjoy the benefits of Thermoskin Thermals for longer.